The use of non-antibiotic feed additives to enhance performance continues to gain strength and recognition as a result of the EU AGP ban in 2006, and the increasing global pressure to limit the use of antibiotics in pig production. Plant-derived or phytogenic feed additives have become an accepted group of such additives. It has recently been estimated that the phytogenic feed additive sector is worth around $500 million in sales per year, a figure which is anticipated to grow significantly in the coming years (Pig World, 2016). Oregano essential oil (OEO) is a well-accepted example of a phytogenic feed additive which can be used in feeds or water to flavor and/or naturally preserve them primarily through the two active polyphenol components carvacrol and thymol. These components are associated with nutritional support for a healthy immune system, support for healthy microbial flora, immune system support and a healthy antioxidant environment. Modern pigs bred for commercial purposes are fast-growing, lean and generate a lot of body heat. This is further complicated with confined housing and high stocking densities that make it difficult to thermoregulate and eliminate excessive body heat. 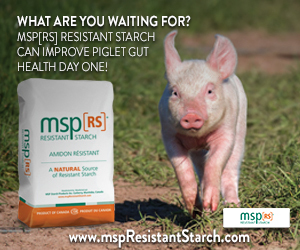 Heat stressed pigs have low performance, poor production results and impaired reproductive function. Recent feeding trials, (Li et al.) compared the performance of piglets fed an unsupplemented control diet with that of piglets fed a diet supplemented with antibiotics or a combination of oregano/EOs. Oregano, as well as several types of herbal products and their oil extracts, have enhanced piglet performance and resulted in growth-promoting effects. The proposed mode of action of oregano and key herbal products is attributed to piglet nutritional support of healthy flora, impact on oxidative stress, support of the immune system and consequently, improvement in pig performance. “With the reduction in use of antibiotics, we recognized the need to supply veterinarians a high-end, oregano-based product to help with stress caused by environmental conditions, transporting, weaning and disease challenges,” states Richard Mihalik, Research and Development Director at Aurora Pharmaceutical, LLC. 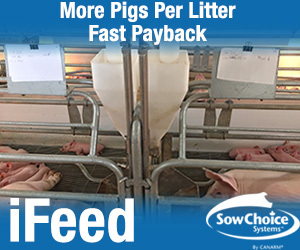 “And we wanted to provide it in a convenient solution that’s easy to administer in the water or on feed. According to Mihalik, previously existing products were gloppy suspensions of gums and other emulsifiers intended to make oil-in-water emulsions. Unfortunately, these oil-in-water emulsions tended to separate easily and were difficult to resuspend. This results in never really knowing how much oregano oil you are giving from administration to administration. Too much oregano oil in a dose can result in reduced water or feed intake due to objectionable flavor and not enough can result in diminished benefits. Mihalik notes these various oregano products also suffer from poor odor masking, and excessive odor from the objectionable portions of the oil can result in decreased consumption of feed or water, both of which can result in reduced benefits. Finally, some of the products out there require the discontinuation of chlorination and the use of a separate water stabilizer when used. “This is a risky practice, because when the transition from chlorinated water to non-chlorinated water is made, there is an opportunity for a significant unhealthy biofilm to form and be deposited as a stubborn biofilm in a water medicator system,” stresses Mihalik. To address these issues with the current products, Aurora designed a next generation formula that completely avoids the issues of oil-in-water solutions. The components of the true solution are designed to retain the more pungent components of oregano oil when mixed with water so that the odor, and thus the flavor, is improved. Finally, this formula was designed to be compatible with both chlorinated and non-chlorinated water without the addition of stabilizers to avoid the opportunity for unhealthy biofilms to form during transition. In fact, the main non-essential oil component of the formula helps limit biofilm formation on surfaces, supporting a healthy water delivery system. As the industry knows, not all oreganos are created equal. “Aurora’s Oral-Pro® Oregano product offers a stable solution compared to some emulsion formulations that may separate and require frequent shaking,” Mihalik notes. “In addition to offering strong antioxidant characteristics which help support the immune system while improving gut health and greatly reducing environmental and production stress, our highly improved manufacturing process helps increase the stability of the oregano solution, unlike many competitive products that report a considerable loss of activity with high pelleting temperatures. About the Author: Steve McKinley, DVM, PhD., is a Veterinary Pathologist that has been writing about animal health issues and answers from his home in Spanish Fort, AL for more than 30 years. He can be contacted at drwareagle74@gmail.com.